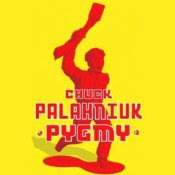 I didn't narrate Chuck Palahniuk's Pygmy but I did direct it, and it's probably the toughest project I've ever worked on. The book is written in a made-up language, somewhat resembling English but (according to Chuck) drawn mostly from the cadences and syntax of his Lithuanian relatives when they tried to speak English. Many of you will not be old enough to remember the Sid Caesar Show, which was must-watch comedy TV in the 1950's. (I'm not old enough either, but I loved watching reruns of 1950's TV shows when I was a kid in the 1960's.) They had a regular series of sketches based on what was then a trendy influx of foreign movies flooding the American market. Caesar, Carl Reiner and other members of the cast would play out a ridiculous scenario involving some melodramatic situation, improvising the dialogue in a made-up language that vaguely resembled French or Italian or something else, depending on the costumes and set dressing they'd pulled out of storage. What was so fun about these pieces was that you always understood exactly what they were saying, even though they were talking gibberish. Typically, in a climactic moment, one of the actors would burst out with an exclamatory word or phrase, like "Pastamajamatooboo!!!" and the other actors would pick this up and run with it. "Aaaaahhhhh, pastamajamatooboo!!!" "Si, si, pastamajamatooboo!!!" "Aaaahhh, non so pastamajamatooboo!!!" and so on. The word clearly had some shocking or profound (or even lewd) implication, but exactly what that was was left to the viewer to decipher. As a young acting student, I remember doing exercises that involved playing out a familiar story with made-up words, similar to what they did in these Sid Caesar sketches. The idea was that if you knew what you were saying, it didn't matter how you said it. This has important implications for the performance of, say, Shakespeare, where a modern audience won't grasp all the vocabulary or syntax, but they must be able to understand everything you are saying. For Pygmy, Paul Garcia and I had to parse the sense behind the nonsense of every single sentence. For example, if you listen to the sample on Audible, it will hopefully not take you long to understand that our young "foreign exchange" student, dubbed Pygmy by his American host family, is first shaking hands with his Host Father (in the process assessing his weight and general health), then notices a badge pinned to his shirt pocket alerting Pygmy to the salient fact that Host Father works in a nuclear facility. And so on. My approach was to pre-read the script to grasp the general story; then I set aside the text during the recording sessions and just listened. If I didn't understand exactly what was being said, I would ask Paul to read the sentence or paragraph over until I did. Sometimes we had to do eight or nine takes, crafting the emphasis and phrasing so that the meaning was absolutely clear without any strain on my part. This required a tremendous amount of visualization from the narrator, so that the listener would get a clear picture of the action. In some cases it took us a while to figure things out, as when Pygmy describes the songs he has to learn for Chorus. We'd sit there puzzling over it until one of us would shout, "I've got it! Rain Drops Keep Falling on My Head!!" It was an amazing experience for both of us, working together in a way that we usually don't have the time or opportunity to do. On the other hand, I'm not sure every book would withstand the scrutiny we had to bring to this project.